Hurricane season is almost over. But before you know it, it’ll be time to put up the window protection again in Fort Walton Beach. Some areas of Florida’s panhandle saw devastating storm damage this year and, unfortunately, the threat of hurricane strikes is there every year for residents along Florida’s coastlines. When it’s time to prepare for storms again next year, you can be ready with strong hurricane panels from Empire Construction & Development. Our aluminum storm panels are engineered to be approximately 25% stronger than flat panels or plywood. This means these hurricane panels can stand up better against hurricane-force winds and the impact of flying debris. When wind speeds outside are over 100 MPH, and tree branches start snapping, you’ll want to be sure you have strong storm protection on your windows. When the items your neighbors forgot to bring in become flying projectiles, you’ll want to know your windows are covered with a high-quality storm panel. When you order hurricane panels from Empire Construction & Development, you will get the durable shutters you need to protect your home’s windows during a storm in Fort Walton Beach. Clear hurricane panels from Empire Construction & Development are another storm panel option for homes and commercial buildings in northern Florida. When you use our clear panels on your windows, you’ll get reliable storm protection — and you’ll still be able to see out of your windows! Protexan clear panels are made of a durable polycarbonate resin. Polycarbonate panels won’t rust, and there are no sharp edges to worry about either. Homeowners can use clear panels on one or more of their windows, to let light in while their home is shuttered up; one or two clear panels can be used alongside aluminum panels for the same effect. If you own a restaurant or retail store in Fort Walton Beach, you can use our clear hurricane panels to cover your building’s windows in the days before a storm, without having the ‘shuttered up’ look – letting locals and visitors know you’re still open for business. When it’ time to close up, your window preparation will already be taken care of. At Empire Construction & Development, we help our customers in some of the most storm-prone areas of the country keep their homes and other buildings safe from hurricane damage. 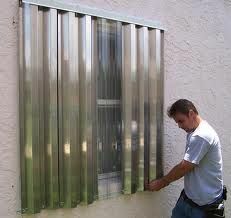 You can order the storm panels you need for your windows from us at HurricaneShuttersFlorida.com. In addition to providing customers in Fort Walton Beach with aluminum and clear hurricane panels, we custom-make: accordion hurricane shutters, rolling hurricane shutters, Bahama hurricane shutters, Colonial hurricane shutters, and more. Contact us for a free price quote on storm panels for your building in Fort Walton Beach, or call: 888-474-3555 to hear about this month’s storm panel deals. Get a start on next year’s hurricane preparation by ordering storm panels from Empire Construction & Development.